Camping parties are SO MUCH FUN! I love this PINK Camping Themed 1st Birthday thrown by Rory Kate’s mom, Jen of Little Sprout Creations! 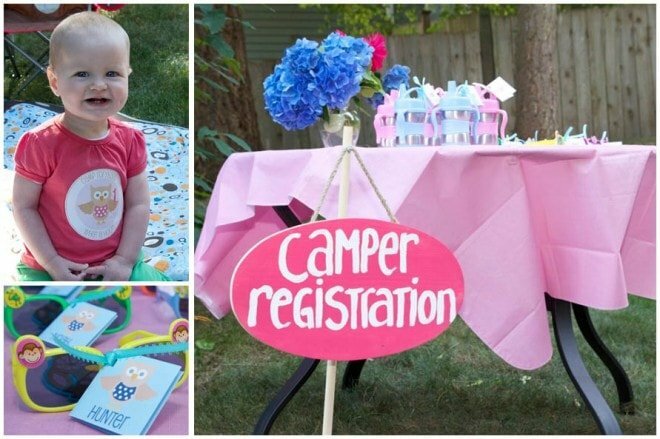 She started off the party with a darling pink wooden sign directing them to the backyard to enjoy CAMP RORY. I love the rustic look of the wooden signs. Jen shared, “After arriving at Camp Rory, guests headed to the Camper Registration table to pick up their camping equipment. The under-1 crowd received stainless steel sippy cups, and their older siblings received sunglasses, and a camping merit badge to wear during the party.” HOW CUTE?! I love how Jen really embraced the theme and transformed her yard into a camping wonderland! 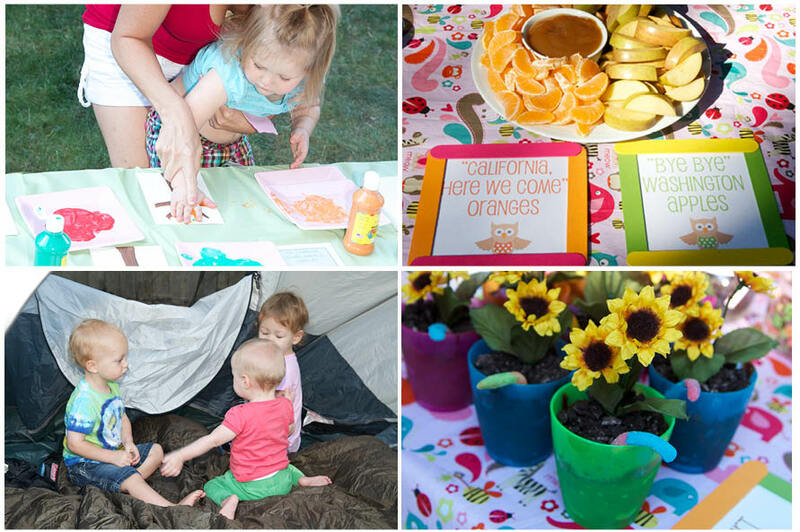 She filled the yard with tents, camping chairs, and pom-poms! 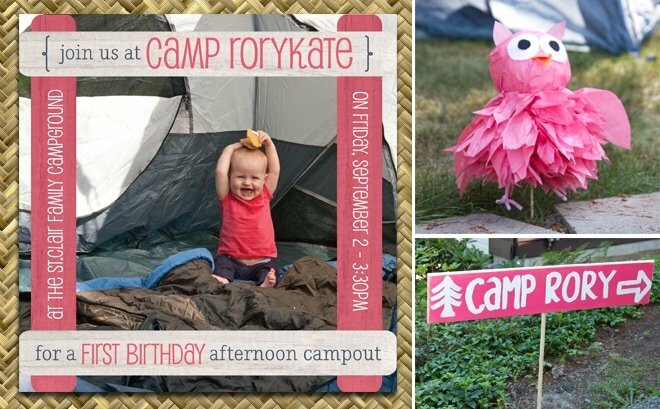 My absolute FAVORITE ELEMENT of Rory’s Camping Party are the DIY Tissue Pom Owls! 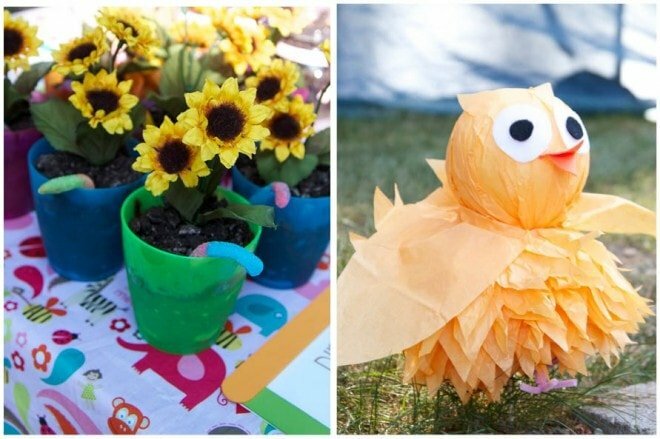 They are absolutely the cutest, and we’re lucky to have the FULL DIY Tutorial from Jen herself so head over for the how-to on creating these darling owls (plus a HALLOWEEN tip too). The kids enjoyed s’mores on a stick, dirt cups (chocolate pudding with crumbled oreos on top + flower + gummy worm garnish), and a MIX-YOUR-OWN-TRAIL-MIX bar set up with dried fruit, cheerios, bunny grahams, + raisins). Perfect little eats for the “campers”! They also enjoyed push-up pop parfaits (cute reusable treat containers). 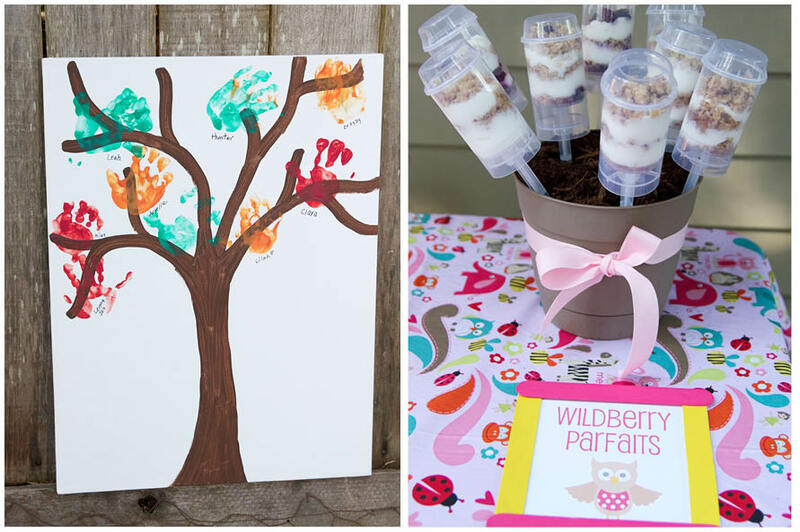 Hope you loved this cute party as much as I did + were inspired by Jen’s cute ideas and decorations. 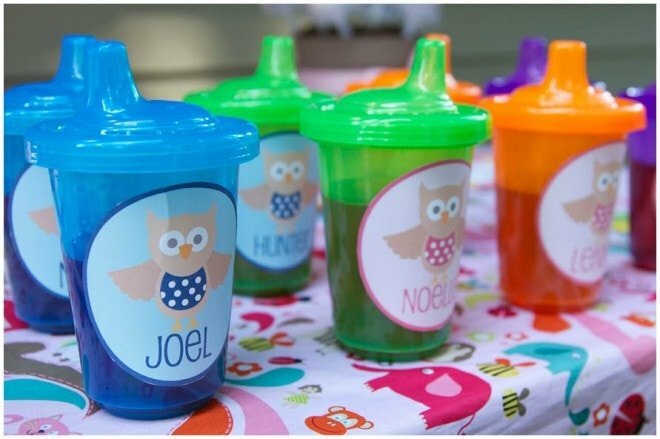 Where did you get the personalized sippy cups?? Please email me and lmk! Thanks… LOVE your party btw!! Will you email me and let me know where you got the decals done for the cups please! Leslie – this is a party feature, you’ll need to click through to the party resources at the bottom to find the information you’re requesting.